KVS PGT Final Result Check Here. KVS TGT (P&HE) Final Result Check Here. KVS PRT Music Final Result Check Here. KVS Librarian Final Result Check Here. KVS Librarian Result Check Here. KVS Librarian Cutoff Check Here. KVS TGT/PGT Result Check Here. KVS TGT/PGT Cutoff Check Here. KVS Librarian Result 2019 Check Here. KVS PRT Music Result 2019 Check Here. KVS Vice Principal 2018 Final Result Check Here. KVS PGT. TGT Answe Key 2018 Check Here. KVS TGT/PGT Interview Letter Check Here. KVS Librarian And PRT Music Interview Letter Check Here. KVS PGT, TGT, Vice Principal/ Principal 2018 Interview Letter Check Here. 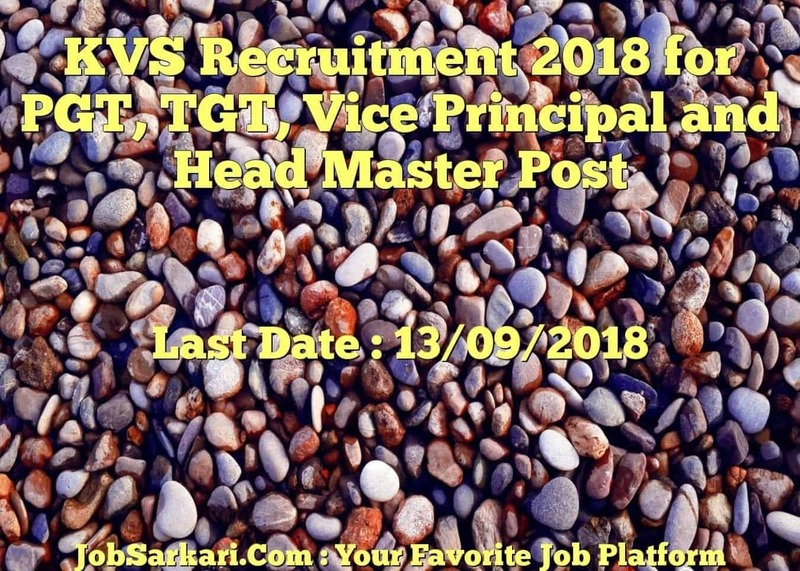 KVS PGT, TGT, Vice Principal/ Principal Post Admit Card 2018 Check Here. KVS Notification is out. 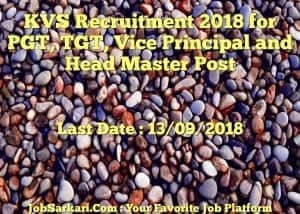 KVS is recruiting for 8339 TGT / PGT / PRT 2019 Final Posts. You can check KVS - Kendriya Vidhyalaya Sangathan last date, download KVS notification, visit KVS official website and check other KVS Vacancy details.Complete Vacancy and recruitment Details about 8339 TGT / PGT / PRT 2019 Final vacancies in KVS are provided below by JobSarkari.Com only for you. Last Date for Payment of Exam Fee 13/09/2018. Date of Exam For Vice Principal/ Principal. 03/11/2018. Date of Exam For TGT, PGT And PRT. 22/12/2018 And 23/12/2018. Principal Post Genera/ OBC Rs.1200/-. TGT/PGT/PRT Post General / OBC Rs.750/-. Mode of Payment Application Fees Cab be Submitted through Online Mode. Post Graduate Teacher (PGT) Candidate Must Have Passed Post Graduation Degree in Related Subject With 50% Marks and B.Ed. Max 40 Years. 277 172 95 48 592. Trained Graduate Teacher (TGT) Candidate Must Have Passed Graduation in Related Subject With 50% Marks and Qualified CTET Exam. Max 35 Years. 938 520 300 142 1900. Principal Candidate Must Have Passed Post Graduation Degree and B.Ed. With 15 Years of Experience of Teaching in Any School or Educational Institute. 35 to 50 Years. 41 19 11 05 76. Vice Principal Candidate Must Have Passed Post Graduation Degree and B.Ed. With 05 Years of Experience of Teaching in Any School or Educational Institute. 35 to 45 Years. 117 57 31 15 220. Librarian Candidate Must Have Passed Graduation in Library or B.Lib or Diploma in Library Science. Max 35 Years. 24 14 08 04 50. Primary Teacher (Group-B) Candidate Must Have Passed Class 12th With 50% Marks and Qualified CTET Exam With Diploma in Elementary Education. Max 30 Years. 2672 1431 798 399 5300. Primary Teacher (Music) Candidate Must Have Passed Class 12th With 50% Marks and Graduation in Music. Max 30 Years. 101 54 31 15 201. Total No of Post 4170 2267 1274 628 8339. Q. What is the Last Date For KVS TGT / PGT / PRT 2019 Final Vacancy ? A. Last Date for KVS TGT / PGT / PRT 2019 Final Posts is 23/09/2018. Q. What is the Form Type of KVS TGT / PGT / PRT 2019 Final Recruitment ? A. The Form Type for KVS TGT / PGT / PRT 2019 Final Posts is Online. Q. How many vacancies are available in Kendriya Vidhyalaya Sangathan TGT / PGT / PRT 2019 Final Posts ? A. There are about 8000 Vacancies in Kendriya Vidhyalaya Sangathan TGT / PGT / PRT 2019 Final Posts. Q. What is the Full Form of KVS ? A. Full Form of KVS is Kendriya Vidhyalaya Sangathan .